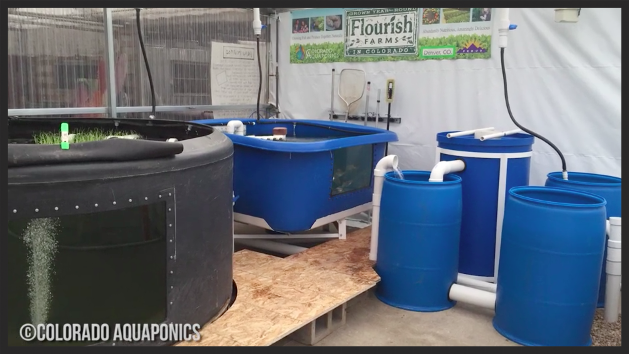 Flourish Farms takes eco-friendly practices to the next level and uses about 11,000 gallons of water in total, which recirculates through a single pump over and over again. GrowHaus, where Flourish Farms is housed, aims to provide healthy, affordable options to the neighborhood of Elyria-Swansea, a Colorado food desert. In this episode of Sustain, we meet JD Sawyer, founder of Colorado Aquaponics, which houses an aquaponics farm known as Flourish Farms. “The food system is out of balance. We’ve got to figure out a way to have higher quality foods using less resources, period, or it’s not gonna work. It’s really gonna take a grassroots effort. Instead of fighting the model, we’re just gonna have to change it.” Says JD and he believes that Aquaponics can be the solution. Aquaponics is defined as an eco-friendly system that recirculates water from a fish tank through a vegetable grow bed. Nutrients from the fish waste feed the plants and the plants filter the water to keep the fish healthy. Flourish Farm services restaurants and markets within a five-mile radius. “All of our chefs, they want to have a personal connection with the farm,” says Sawyer. “A lot of what we do is based upon their demands, the products that they really need, week in and week out.” Flourish Farms doesn’t sell at retail or wholesale prices, but somewhere in between to ensure that each partnership is mutually beneficial. The increasing transparency of menu ingredients has allowed chefs and restaurant owners to communicate with guests where these products come from, educating them about aquaponics while giving Flourish Farms some additional buzz. Just as admirable, the GrowHaus, in which Flourish Farms is housed, aims to provide healthy, affordable options to the neighborhood of Elyria-Swansea, a Colorado food desert with no grocery stores within a 2-mile radius. This area is known for being the most polluted zip code in Colorado. Essentially, the GrowHaus is a non-profit urban market, food hub, and education center located in Elyria-Swansea.